For this week I am going to write a diary of November 18, Tuesday. 3:25 a.m. The alarm rings and it’s time to start another day. I pack my husband Joe’s lunch. He doesn’t eat breakfast until his first break so I pack a ham and cheese sandwich for that. For lunch I put in some pizza casserole, peaches, a clementine, cookies, and crackers. Then I fill his water jug with ice cubes and water. 4:00 a.m. Joe leaves for work. I go back to bed. 5:00 a.m. I get up again as daughters Elizabeth, 20, and Susan, 18, are ready for work. Son Benjamin, 15, usually leaves around the same time as they do. Today he doesn’t have to work, as something at the sawmill is broken down. It is 10 degrees this morning with a wind-chill of minus 10 so I think Benjamin is glad to stay home. 5:15 a.m. The girls leave for work at the RV factory. 6:00 a.m. I check the phone for messages and have a message that says school is cancelled for the day. There is a winter storm warning and because the wind-chill is so cold, it is cancelled. The children weren’t awake yet so I let them sleep in. 8:00 a.m. Everyone is awake and we have grilled cheese sandwiches and cereal for breakfast. 9:30 a.m. Dishes are washed and the morning work is done. The boys carry the baskets of clothes up from the basement. We washed clothes yesterday and hung the laundry on the lines in the basement. They were dry and ready to bring up. The girls fold all the clothes and put them away. 11:30 a.m. The boys and Lovina are out in the field sledding down the big hill. There isn’t that much snow but enough ice to make the sled glide down the hill. 1:30 p.m. The children are back in and warming up. We have ham and cheese sandwiches and vegetable soup for lunch. 3:00 p.m. Daughters Elizabeth and Susan are home from work. 4:00 p.m. Loretta, 14, and Lovina, 10, have cleanings at the dentist so I leave with them. After their cleanings we go to get some groceries. 5:45 p.m. Back home. Joe came home from work soon after we had left. Chores are done. 6:30 p.m. The girls have supper ready, which is fried chicken, vegetable soup, cheese and crackers. We are also enjoying some venison summer sausage and jerky Timothy brought us from the deer he shot. 7:30 p.m. Dishes are washed and everyone is getting cleaned up for bed. The wind is still very cold with the temperature never going higher than 19 today. 9:00 p.m. Everyone is in bed so I think I’ll do the same. Until next week, God bless! 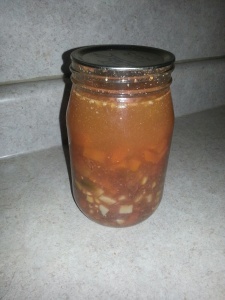 This week I’ll share my recipe for vegetable soup. We also can some (see below) so we will have it for a quick meal. Brown the beef chunks in a large skillet over medium heat. Put the beef chunks and the whole onion in a large pot and add the remaining ingredients. Add enough water to cover all the vegetables. Cook over medium heat until the vegetables are soft, about 30 minutes. Good morning to all! All is quiet here since the bus left with the four youngest children. Benjamin hasn’t been home since yesterday morning. Something broke down at Mose’s sawmill, so Benjamin stayed there last night to work later. Waiting on the part for the mill put them behind. Benjamin always enjoys staying there as Mose has a brother Freeman, 16. They both enjoy hunting and fishing. 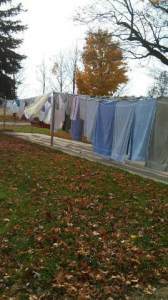 Monday was a beautiful day and we were able to get all the clothes dried outside. Now this morning the temperature is at the freezing mark. Yesterday daughter Verena and I cleaned out the stove and refrigerator/freezer that runs off of propane. We use an air compressor to blow out the burners. It’s always a big job, but always nice to see it nice and sparkling clean when it is done. I think it’s still easier than when I had to clean a kerosene stove. Cleaning the pipeline and getting the burners all cleaned and trimming the wicks was a big job. Daughter Elizabeth now has another puppy, Crystal, that is four months old. Crystal is quite a bit bigger than Izzy. Izzy is six months old and enjoys her playmate. 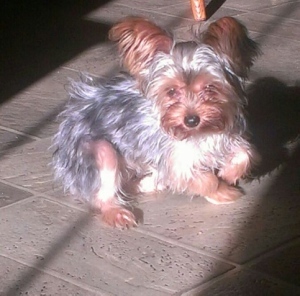 Crystal is a Beiwer Yorkie and weighs seven pounds. 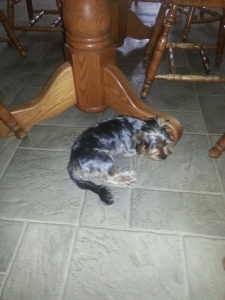 Izzy is a teacup Yorkie so she is full grown at three pounds. Lovina’s daughter Elizabeth has a new puppy, Crystal. Crystal loves to hide our shoes. 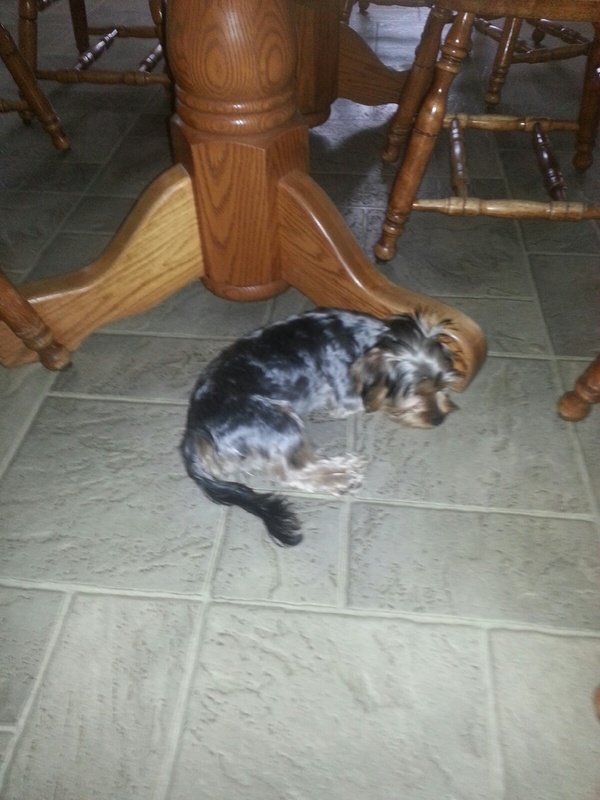 Right now she is lying under the table sleeping while I write this column. Izzy sleeps in the most uncomfortable positions, such as on the top of the back of a recliner. 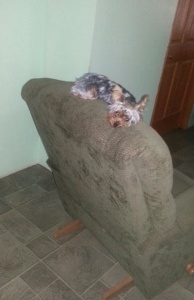 Izzy manages to sleep on the top of the recliner. Last Friday my husband, Joe, and I, along with our six youngest children, traveled to the Berne community to attend the wedding of Solomon and Rosanne. Sister Emma and Jacob’s two daughters also went with us. It was nice to see several uncles and aunts at the wedding, and also cousins that we don’t often see. Sister Liz was at the wedding and we visited at her house in the afternoon. We also made a short stop at brother Amos and Nancy’s before we headed back to the wedding for the evening meal. We were served delicious meals both times. On the menu were chicken, mashed potatoes, gravy, noodles, dressing, corn, broccoli and cauliflower salad, homemade bread, butter, grape jelly, cake, three kinds of pie—pumpkin, pecan, raspberry cream—mixed fruit and ice cream. Candy bars were also passed out to everyone at the end of the meal. We wish the newlyweds a blessed marriage. For this week’s recipe, try this pumpkin cobbler. We enjoyed it one evening for supper. 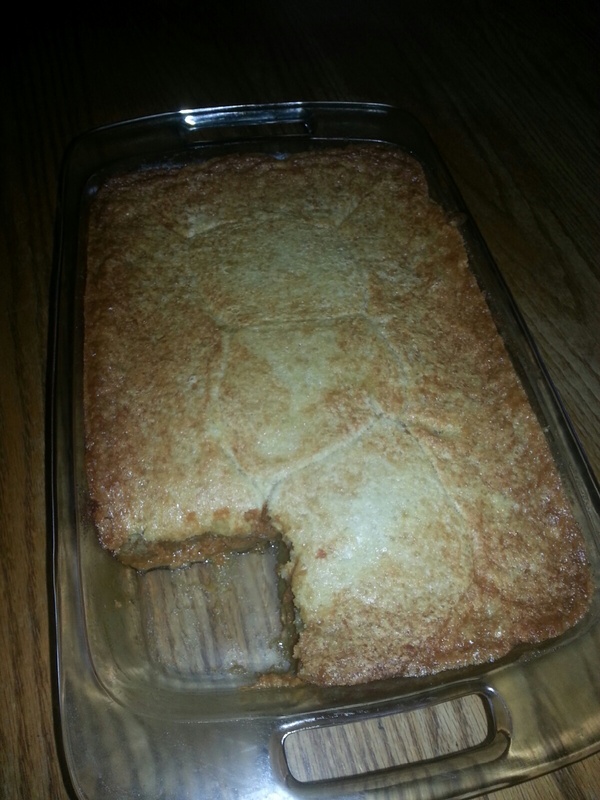 Pumpkin cobbler, a treat for any family on a chilly autumn day. 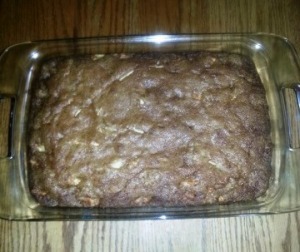 Melt butter in 9×13-inch baking pan. Mix batter and pour over melted butter. Mix the filling ingredients together and slowly pour mixture over batter. Bake at 350° for one hour or until set. Our four youngest children just left on the bus for another school day. It is a little after 7 a.m. and since the time is turned back an hour, it is now daylight when they get on the bus. It won’t be for long though, with each day getting shorter. Thursday afternoon and evening will be parent-teacher conferences. On Friday there won’t be school. It is hard to believe the first quarter of this school term is over. On Friday, we plan to attend the wedding in Berne, Ind., of Solomon and Rosanne. The children are excited that there is no school that day so they can go along to the wedding. Last Friday we had snow flurries and it was very cold and windy. On Saturday the temperature didn’t go over the mid-40s. Then on Monday we had a nice, sunny day. Daughter Verena hung all the laundry outside. It was all dry by late afternoon. Days like that are going to be few from now on. It was so nice to be able to fold the clothes and put them away all in one day again. Daughter Verena hung all the laundry outside. It was all dry by late afternoon. Son Benjamin isn’t working this week. Mose shut his sawmill down this week to get some deer hunting done. Mose and Benjamin went Monday but didn’t have any luck. Mose shot a deer last week with his bow and arrow. Today Verena, Benjamin, and I plan to drive to town with the buggy and our horse Itty Bit. In his free time Benjamin likes to bike and collect aluminum cans. Here in Michigan there is a 10 cent deposit on the cans. He has saved up quite a bit of money doing this and it helps keep the countryside cleaner. A view of the Eicher family animals. Saturday evening those that were at Jacob and Emma’s for supper in honor of Jacob’s 42nd birthday were: my sisters Verena and Susan; our family, along with the girls’ friends Timothy, Mose, and Marvin; and also Menno and Manuel (Jacob and Emma’s daughters’ friends). We had a delicious supper of barbequed pork steak, potluck potato casserole, macaroni salad, pickled green beans, homemade bread, butter and strawberry jam, hot pepper butter, hot peppers, strawberry pie, dirt pudding and ice cream cake. 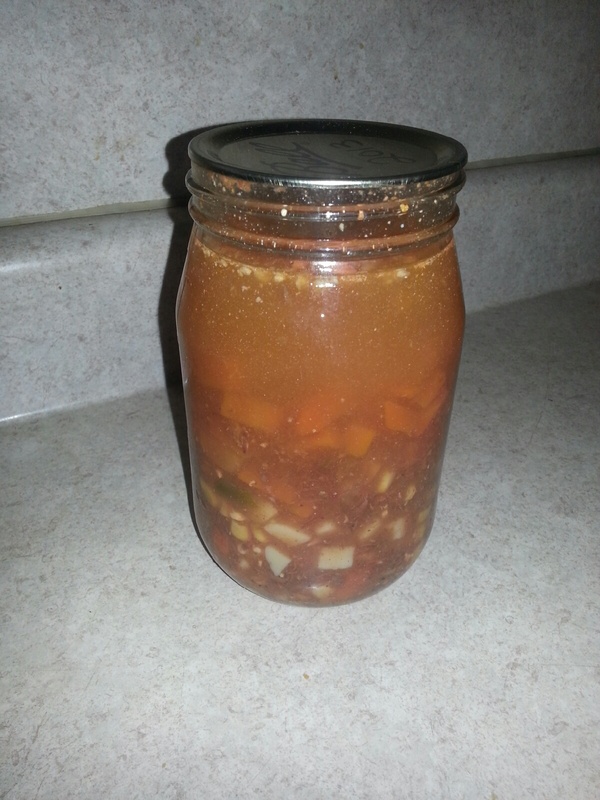 A reader asked for the recipe for the homemade bug exterminator. Take an empty plastic soda bottle, add 1 cup white sugar, 1 cup vinegar, and a banana peel. Fill the bottle three-fourths full of water and hang uncovered in a tree. It may take a week for the trap to start attracting bugs. It collects all kinds of insects. This was the only thing Dad would do for our apple trees. He didn’t like using chemicals so he did it this natural way. With Thanksgiving Day only several weeks away, I will share the dressing recipe I use to stuff my turkey. We call it dressing if it’s baked in a baking dish. But we called it stuffing if we use it to stuff a turkey. Preheat the oven to 350°F. Grease an 8-cup casserole dish or cake pan. Dissolve the soup base in the water. Alternately, use 2 cups hot water, potato water, or chicken broth. Add all the remaining ingredients and mix well. Pour into the prepared dish and bake for 40 to 45 minutes. We are in the final week of October. It is a dark, dreary morning. This weekend we need to turn our clocks back an hour. I still have trouble getting used to the changing of time in the spring and fall. My husband Joe, son Benjamin, and daughters Elizabeth and Susan are all at work. Daughters Loretta and Lovina and sons Joseph and Kevin are in school. The house is pretty quiet with just daughter Verena and me here at home. Verena is finishing up the morning work as I write this column. Our plans for the day are to cut out quite a few pants for Benjamin. 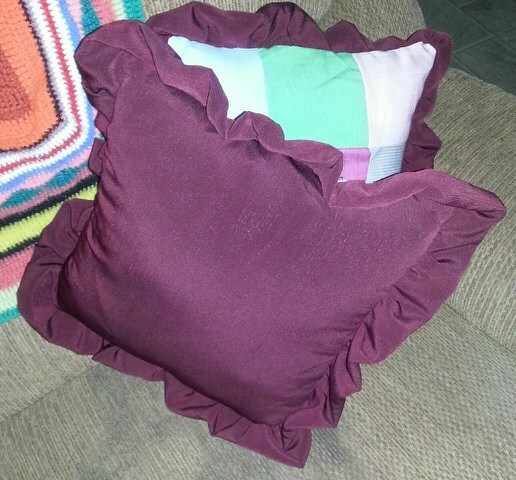 I cut out and sewed one for him yesterday as I needed a new pattern. He has grown so much and is taller than I am. The pants fit well and he wore them to work today. I didn’t want to cut out more until he tried one pair to see how it fit. I have had the material here for quite some time and always pushed the sewing to the back of my list. We also want to sew Kevin more pants. We’ll work on getting them all cut out. I was really disappointed when sister Emma told me that aunt Lovina and uncle Abe Raber from Baltic, Ohio, and cousin Leah (Lovina’s daughter) and Elmer Schwartz from Campbellville, Ken., stopped for a visit when I wasn’t home one day last week. Lovina is my mom’s sister and we were always together growing up. I was named after her. On Saturday, Joe’s brother Benjamin, his wife Miriam, and their children Josh, Adrianna, Beth Ann, Travis, Silas, and Victoria, from Sugarcreek, Ohio, came for a visit. Victoria is four months old and this was the first time we got to see her. She is a cutie with lots of black hair. The girls made popcorn and lemonade for everyone. The cousins don’t often see each other but it didn’t take them long to get reacquainted. Saturday evening was so nice. We enjoyed barbecued chicken and hot wings since the weather was so nice. Also on the menu were lettuce salad, chips and ice cream. Those joining us for supper were Timothy (Elizabeth’s friend), Mose (Susan’s friend), and Marvin (Verena’s friend). Joining us for brunch on Sunday were sisters Verena and Susan and sister Emma, her husband Jacob, and their family, as well as Timothy and Mose. Niece Elizabeth’s friend, Manuel, niece Emma’s friend, Menno, and Verena’s friend, Marvin, weren’t able to be here on Sunday as they had communion services in their church district. Our menu for brunch was breakfast casserole, toast, strawberry jam, cheese, hot pepper butter, hot peppers, coffee, orange juice, chocolate milk, cinnamon rolls, delicious cookies, and peaches. Emma brought the cinnamon rolls, hot pepper butter, orange juice and chocolate milk. Verena and Susan brought the peaches and cookies so all I had to make was the casserole. We enjoyed a nice family day together. 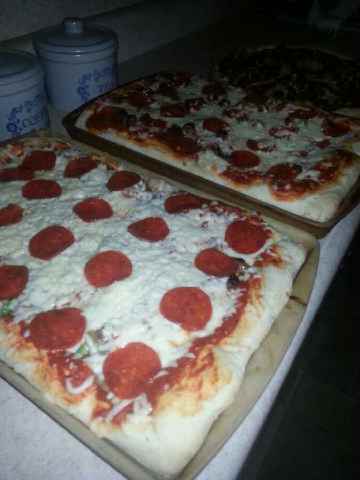 Last week one evening, I made pizza using a different dough. 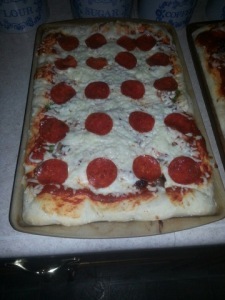 We really liked the dough so I will share it with you readers. Enjoy! This week Lovina tried out a new recipe for pizza dough that she shares in the column. With eight children in the household, it takes more than one pizza to feed to the family of Lovina and Joe Eicher. Mix warm water, yeast, and 2 teaspoons sugar. Let stand 5 minutes until bubbly. In separate bowl, mix cold water, 2 tablespoons sugar, garlic powder, oil, salt, oregano, and 3 cups flour; beat until smooth. Add yeast mixture, then add rest of flour. Knead until elastic; let rise until double. Press half of dough on a greased pan. Let rise 5 to 10 minutes. Repeat with other half. Add pizza sauce and bake at 400° for 10 to 15 minutes. 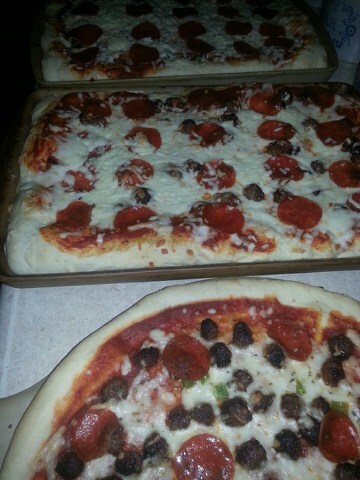 Add rest of toppings and bake until hot and cheese is bubbly. We had a good turnout at the book signing in Warsaw, Ind., on Saturday. Thanks to all of you readers who came and for all your encouraging words! I’m wishing a happy birthday to Timothy (my daughter Elizabeth’s friend). His birthday was on Saturday. Today is another gloomy autumn day where we live. We had quite a few days like this lately. Verena and I washed laundry yesterday but ended up hanging it on the lines in the basement to dry. The sun was out and just before we were ready to hang the clothes up it started raining lightly. The clothes dry very quickly in the basement with the coal stove going down there. I really would miss not having my spinner, which spins a lot more water out of the clothes even after they are put through the wringer on our Maytag washing machine. The squirrels outside the window are busy gathering the acorns from our trees. Another sign that winter weather isn’t too far off. 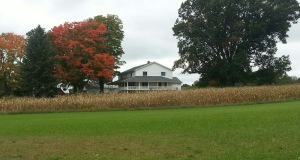 The corn all around us is also being harvested. My husband Joe and son Benjamin, 15, are glad to see the corn being harvested so it will give the deer fewer places to hide. They are still trying their luck at getting a deer with bow and arrow. Daughter Lovina, 10, went home from school with her friend Marianna yesterday. She spent the night there in honor of Marianna’s 10th birthday, and went to school with her today. We missed not having her home but I’m sure she had a great time with Marianna. Elizabeth, 20, and Susan, 18, didn’t have to work at the RV factory on Friday and Monday. They were glad for the break. Elizabeth sewed a shirt for Timothy, and Susan sewed a dress for herself. I still need to show Susan some of the steps on how to put a dress together. She is getting better at it every time. She cut out a shirt for Mose and wants to learn how to sew it together. Daughter Verena, 16, is also getting pretty good at sewing. 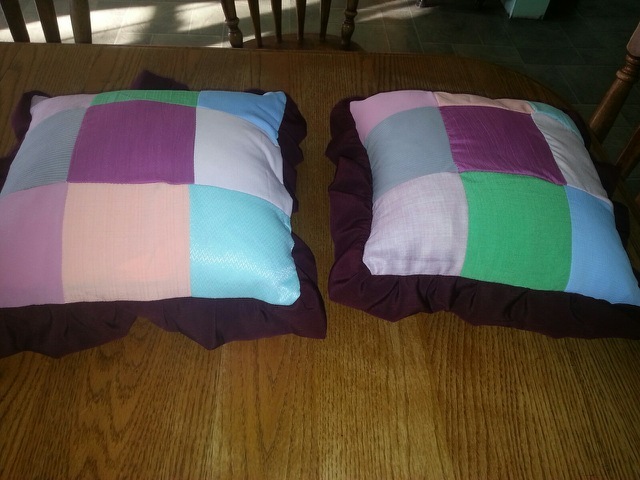 She is sewing pillows every chance she gets. 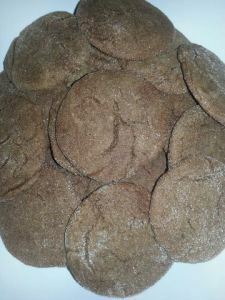 I have a reader that would love a recipe for chocolate covered cashews crunch. I am sorry I do not have a recipe for this. Would any of you readers be so kind to share if you have one? Instead, these are good cookies we always enjoy. Cream shortening and brown sugar. Add egg and molasses, mixing well. Combine flour and next five ingredients; add to shortening mixture, mixing well. Cover. Chill two hours. Shape dough into one-inch balls, and roll in sugar. Place on lightly greased cookie sheets. Bake at 350° for 12-15 minutes. Another week has already gone by, which makes it time to get this column written. The weeks just fly by. I write my columns in one-subject notebooks which have amounted to quite a few in the years of penning this column. This month 12 years ago is when I wrote my first column. I think that was the hardest column for me to write. Lovina keeps all of her handwritten columns in spiral notebooks. Joseph, 12, was my baby at that time. Elizabeth, 20, was eight and in second grade. Susan, 18, was in kindergarten and six years old. Verena was four, Benjamin three, Loretta, two. I remember how hard it was to write the column and keep an eye on the four preschoolers. Life still seems busy now but I guess just in different ways. The children get older and each has different plans for the weekend sometimes. Last Saturday, Joseph spent the night at a friend’s house in honor of his birthday. Susan had Mose’s sister’s two little boys here for part of the day Saturday. Loren is four and Jayden, two. Susan gave them pony rides and kept them entertained. Of course Lovina, 10, and Kevin, 9, were glad to help keep them entertained. Elizabeth’s puppy Izzy was the only one not happy to have them here. She is not used to little children and the boys played too rough for her, so she stayed close by one of the girls. My husband Joe started the coal stove Saturday, so the house is cozy again. Our coal was delivered for the winter. Joe hooked a [metal] jacket up around the coal stove in the basement to help get more heat up here if we need it. It has a door on the jacket we can open on days we dry laundry in the basement, to keep more heat down there. Verena and I plan to clean the basement today as dust seems to accumulate and things get misplaced. So it’s high time for another cleaning. Saturday we had a killing frost in most places so the gardens are history for 2014. We have two more wedding invitations on our refrigerator. Rosanne and Solomon will exchange vows on Nov. 7 and their wedding will be in Decatur, Ind. Then on Nov. 20, Edwin and Rosa Mae will exchange their vows in Rochester, Ind. We hope to attend both weddings. Both grooms are Joe’s cousin Leander’s sons. Joe and Leander had lots of good times growing up together. We wish both couples God’s blessings on their marriage and many happy, healthy years together. 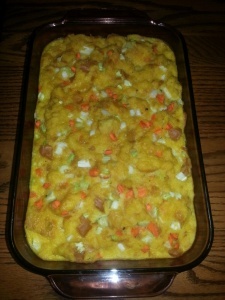 This week I will share an omelet recipe I made for our breakfast on Saturday. I hope you will all like it as much as we did. 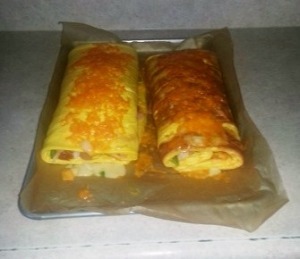 Two yummy breakfast omelet rolls for the Eicher family. Preheat oven to 375 degrees. In a bowl, combine cream cheese and milk. Whisk until smooth, then add flour and salt. In another bowl, beat eggs and then add cream cheese mixture. Cut wax or parchment paper to fit jelly roll pan. Pour into jelly roll pan. Bake 30-35 minutes or until puffy and golden. While that is baking, chop meat, vegetables and shred the cheese. When omelet is done, remove from oven and spread with mustard, then layer meat, onions, pepper and cheese. Roll into jelly roll fashion, removing the paper from the omelet as you roll. Serve with salsa or cheese sauce. The Eicher household dog, Izzy, finds a cozy spot of sunshine in a doorway. First of all, I would like to thank all the readers for their support and many kind words of encouragement I have received. Including a self-addressed stamped envelope helps to get a reply back to you. It is so nice to be able to receive mail directly from my readers now. Hundreds of leaves have already fallen from the trees around our house and we have such a beautiful array of colors on the trees. I love to drive the horse and buggy at this time of the year and take in all the beauty that only our Master Artist can create. The local farmers are busy in the fields harvesting the seed corn. Fall scenery near the Eicher farm/home. Last night we had a thunderstorm that brought some wind and hail. It is also deer hunting season with bow and arrow. Son Benjamin is eager to get his license to hunt with his bow. He has been doing target practice with Mose (daughter Susan’s friend). Mose said he thinks Benjamin is good enough to hit a deer with his bow. Saturday we all attended the hog roast that our local feed mill had for customers. They had lots of good food that was prepared by some of the Amish women in our community. It was a cold day with the temperature staying under 50 degrees all day. The wind made it seem even colder. My husband Joe is getting the stove ready to set up again for the winter. He had moved it when we had church services to make more room for benches. We have a coal stove in the basement and heat the whole house with it. There is a big vent in the floor that allows the heat to come up to the main floor. Our open staircase to the upstairs bedrooms allows the heat to travel up there as well. It is nice to have the mess from the coal and ashes down in the basement. Daughter Verena and I plan to cut fabric for some pants for son Kevin, 9. I would like to teach her how to sew them. Kevin is getting so tall that he is in need of more pants. Then we also want to make son Benjamin some new pants. Since he is working every day he wears them out pretty fast. Benjamin was off work one day this week as the sawmill broke down. He is back to work as Mose has it running again. Verena is almost done with the breakfast dishes and morning work so I best hurry around so we can start cutting out fabric and sewing. We are enjoying cider and apples from the apple farm close by. Popcorn with that makes a good snack on cold evenings. 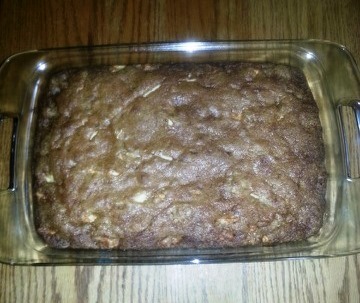 This week I’ll share a recipe for raw apple cake. God bless! Lovina’s deliciously moist raw apple cake. Combine these ingredients and allow to stand 20 minutes. Mix all ingredients and pour in a 9 x13 greased cake pan. Bake at 350° for 1 hour or until set. We have entered the month of October. It’s so hard to believe that autumn is here and the trees are showing their autumn splendor. Our yard is accumulating more leaves every day. Daughter Verena, 16, and I just came home from town. Verena had a dentist appointment and we picked up some groceries. 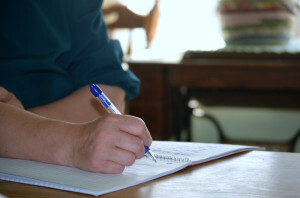 I decided to quickly write my column before the children come home from school when the house won’t be so quiet. 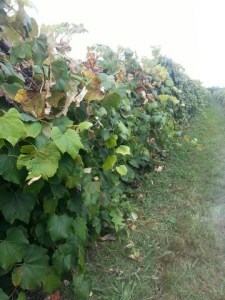 Tomorrow we plan to go to a “U-pick” to gather grapes. Friday and Saturday will be spent canning grape juice. I have two steamers now so canning the juice should go faster. I’ll be glad when that job is done, and will be even happier to have some grape juice again. 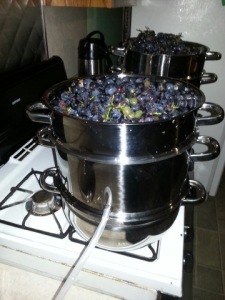 Cooking the grapes to make grape juice. Sunday we hosted a dinner for almost 60 people. Some were local families and we also had quite a few out of state visitors. Timothy and Mose (daughters Elizabeth’s and Susan’s special friends) helped my husband Joe grill pork steak and chicken for the noon meal. They had several grills going and started around 9 a.m. We raised the chickens ourselves, and readers will remember when we butchered and froze them a few weeks ago. Also on the menu besides pork steak and chicken were: mashed potatoes, gravy, dressing, corn, coleslaw, dill pickles, homemade bread, strawberry jam, butter, Jell-O cake, cheesecake, peanut butter and sugar cookies, 12-layer rainbow Jell-O, ice cream, coffee and lemonade. The men also grilled banana and jalapeño peppers with sour cream and seasoning. It was a very nice, sunny day. The afternoon was spent with some playing croquet, and visiting out on the front porch. It was so nice to enjoy the lovely day outside. I’m sure we won’t have too many more days like that before winter arrives. Joe and sons Benjamin, 15, Joseph, 12, and Kevin, 9, spent Saturday cleaning out our other garden. They planted winter radishes for a cover crop in the garden. We still had green tomatoes on our tomato plants. The boys picked them all. A good way to keep the green tomatoes from ripening too fast is to wrap them in newspaper and store in a cool place. I think it gives them a better flavor than if they are just out in the open to ripen. The sun is shining in through the door and Elizabeth’s puppy, Izzy, lays on the floor where the sun hits it. Like most dogs, she loves to soak the warmth of the sun on these chilly days. That puppy gets so spoiled around here. For this week’s recipe I’ll share the 12-layer rainbow Jell-O that sister Emma made, from a cookbook that my sisters Verena and Susan put together and are selling now. It is recipes collected from my brothers and sisters, nieces, nephews and their children. They also have pictures throughout the book, including of the house in which we grew up. The recipe for the 12-layer rainbow Jell-O was submitted by Sara Graber, a granddaughter to brother Albert. Until next week … God bless! Dissolve Jell-O powder for one layer at a time, adding 2 cups hot water for each box of Jell-O. Put 1/2 of dissolved Jell-O and water in a 9x13x4-inch pan. Chill. Save the other half and add 2 to 3 ounces of sour cream. Stir together. Let first layer harden, then put sour cream and Jell-O mixture over that. Do this alternately with every flavor/color, letting each layer chill, and making 12 layers in all. You will have a beautiful rainbow when finished. Keep cold until served. A lovely Tuesday evening! It was a chilly 41 degrees this morning but warmed up into the 70s. Right now it is pretty quiet in this house. Six of our children decided to go the four miles to sister Emma and Jacob’s house. Some rode the ponies and some biked. They wanted to go see Jacob’s new pony. Joseph volunteered to stay home and do the evening chores. Elizabeth stayed to help me with supper. On our menu tonight will be fish, French fries and onion rings. That is always a favorite meal around here. The wedding for niece Elizabeth and Samuel is now over. We wish them God’s blessings as they join hands for life. They had a beautiful wedding day. On the menu for dinner were barbecued chicken, mashed potatoes, gravy, chicken and noodles, dressing, mixed vegetables, lettuce salad, carrot salad, homemade bread, butter, strawberry jam, celery sticks and Nothings. Nothings are a sweet, thin pastry that has been deep-fried. Dessert was cake, cinnamon pudding, zucchini bars, a variety of cookies, mixed fruit and pies—cherry, Dutch apple, pecan and vanilla crumb. 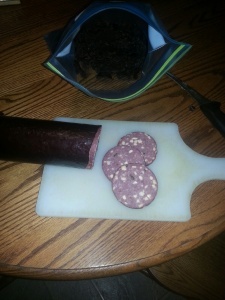 In the evening smoked sausage was added to the menu. My job was to help with the dressing. One hundred eggs were put into the dressing. I will share the recipe with you readers, but I had to reduce the recipe of 20 eggs down to 5 eggs so it will be easier for smaller batches. There was plenty of food left over. It’s always easier to have too much than not enough. It is probably a big relief for sister Liz and Levi to have this over with. A lot of work is involved in preparing for a wedding. The day before the wedding, daughter Verena and I traveled the two hours to Berne, Indiana, to help prepare food for the wedding. The group of us who helped made the Nothings, baked 80 pies, peeled potatoes, and chopped a lot of vegetables such as celery, carrots, onions, cauliflower, broccoli and radishes. This makes it easier to prepare salads, dressing, etc. On the day of the wedding, carrot salad was also prepared in serving bowls. My husband, Joe, and sons Benjamin, Joseph and Kevin cleared out one of our gardens and hauled manure on it. It is now ready to till, and we will plant a cover crop. In the other garden we still have tomatoes, but otherwise I think everything is done for the season. We had a nice crop of cabbage this year, but our potatoes didn’t do so well. 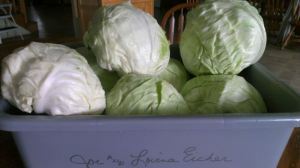 Lovina’s cabbages did well this year. These heads were recently harvested from her garden. The boys and daughter Lovina built a campout area by the big tree in the middle of our cornfield earlier this summer when the corn was short. They had a path through the corn to their camp. If I called for them, they could hear me. Sometimes they would go back there to read. Since it won’t be too long before the corn is harvested, they decided to take down their “camp” for the winter. 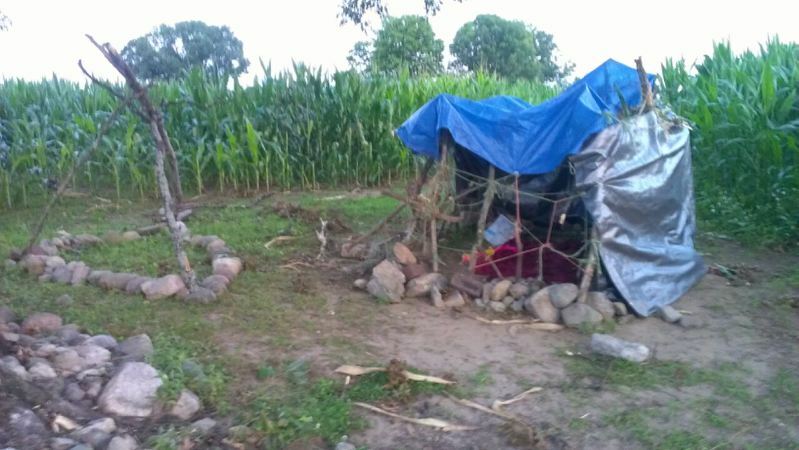 Lovina’s children made this campout area in their cornfield this summer. Beat eggs. Dissolve chicken soup base in hot water. (I buy powdered chicken soup base in bulk, but you can substitute 3 or 4 chicken bouillon cubes.) Add this mixture, along with remaining ingredients, to eggs and mix well. Pour into a greased 9×13-inch pan. Bake at 375° for one hour or until well set. It’s a little after 7:00 a.m. As I look out toward the east, it looks like it will be a beautiful day. The red glow of the sun is beaming over the trees. What a sight to behold. And only our Master Artist can create such wonderful art. The four youngest children left a few minutes ago for school. My husband, Joe, daughters Elizabeth and Susan, and son Benjamin are all at work. Daughter Verena and I are alone now through the day. I am so glad for Verena’s help with laundry, gardening, cooking, and cleaning—and the list goes on. Seems like it doesn’t take long for laundry to accumulate with ten people in the family! Today is September 17—a day that brings sad memories of the passing of my dear mother, Elizabeth Coblentz. It has now been twelve years since she so suddenly left us. Memories—that is all we have left now. She was a great mother and will remain in our hearts forever! How often I would love to talk to her and share the joys and sorrows of my family with her. God has a reason for everything, so let me leave it in His hands. I can only imagine the busy week sister Liz is having. Her oldest daughter’s wedding is this Friday. Daughter Verena and I will travel on Thursday, with some of our relatives, to help bake pies and help with whatever has to be done for the wedding. We leave at 4:30 a.m. on Thursday. We will travel the two hours back home again Thursday evening, and then our whole family will start out at 5:00 a.m. on Friday morning for the wedding. Timothy and Mose, friends of Elizabeth and Susan, will also be going with us. 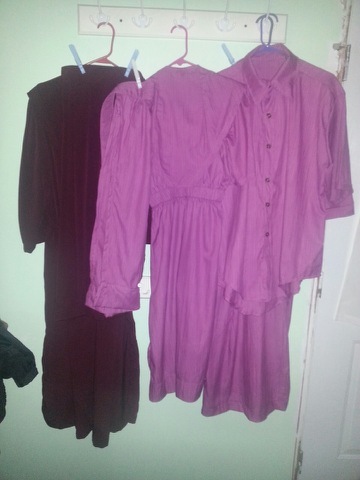 Elizabeth and Timothy and Verena’s clothes are all sewn and ready for the wedding. I still need to sew my cape and apron today. My dress is finished, so it won’t take too long. Lovina has spent a lot of hours sewing special clothing to wear at her niece’s wedding. Verena will bake 100 cookies to take along for the wedding. We thought that would be a way of helping sister Liz. Wish we lived closer so that we could help her more with the wedding preparations. God has a reason for everything, so let me leave it in His hands. Our thoughts and prayers are with teacher Barbara Kay, 20, and her family. Barbara Kay was in an accident not too far from here, along with some other Amish teachers traveling to Indiana to teach school. Barbara Kay was hurt the worst, and doctors think she will be paralyzed. God is above all and can perform miracles. His will is what we need to pray. I think this was Barbara’s first year of teaching school. The Amish van driver, Joe, was also hurt and had a hospital stay. May God comfort all of those that were involved in the accident. The community is having a bake sale to help with hospital expenses for Barbara Kay. Let us all pray that God will give her strength to go on. How suddenly our lives can be changed. Timothy’s brother Alvin, Rhoda, and family took brunch in to brother-in-law Jacob, sister Emma, and family on Sunday forenoon. They invited us to come also. This was in memory of Marilyn, Jacob and Emma’s youngest child; she would have been five years old on Sunday. Marilyn died at the sweet, innocent age of eight-and-one-half months. She is missed dearly, but God wanted another angel. Alvin and Rhoda’s ten-month-old daughter, Clara, passed away three years ago. The two families can sympathize with each other. I’m taking this peaches and cream coffee cake along tomorrow to sister Liz’s house. I have one baking in the oven right now, and it smells so good! This week’s recipe is peaches and cream coffee cake. 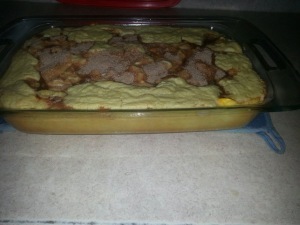 The photo is of a doubled recipe, to feed a group. Mix batter ingredients together for 2 minutes. Pour into a well-greased 8-inch round or square pan. Drain peaches, reserving juice. Arrange peaches over batter. Cream together filling ingredients and spoon over peaches. Mix cinnamon and sugar together. Sprinkle on top and bake at 350° for 30–35 minutes.